Everyone was wondering why Adobe decided to reduce its prices by 15% and this is one reason why: The Adobe CS6 Master Collection doesn’t install properly in Microsoft Windows 8 (32 or 64 bit)! Of course there will be a downloadable update that you have to pay for soon but it’s just annoying having software that can’t be installed every time a new version of Windows comes out. I’ve only has this type of trouble with Adobe software so far… Why can’t it just include a regular installer? 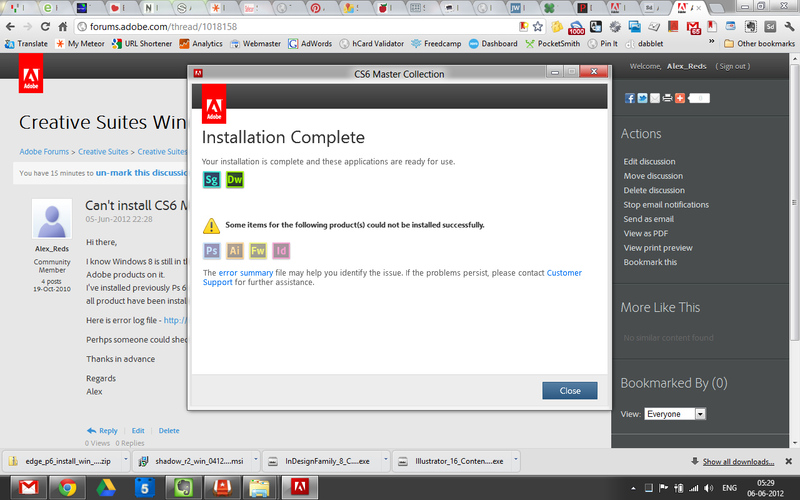 Photoshop CS6 sometimes installs but an error message comes up when trying to install the CS6 Master Collection in Windows 8. Adobe Acrobat, Dreamweaver and Photoshop can kind of be installed at the moment. The rest of the software installation just gets denied. *Adobe still hasn’t fixed the line drawing/scroll bug in Illustrator CS6 as well. Even though they have known about it since CS3 came out. Here is the Adobe CS6 Master Collection installation error log, just in case you wanna have a look.